What do you think of this Mischievous Cat Gnome Massacre? Your search is over for the perfect gift for any garden or home. • DON'T WORRY - only eats gnomes and not dogs, mail men or neighbors. Perfect gifts for gnome lovers or haters, Moms, Dads, Daughters, grandparents. Wonderful housewarming gift. • HIGH QUALITY - handcrafted and made from light durable resin material. • Big enough to be noticed but small enough to fit on a bookshelf. Perfect size for many locations. 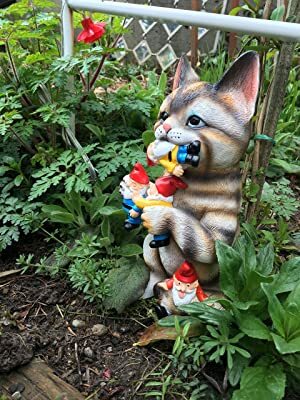 • Guaranteed to make the number of gnomes in your garden greatly decrease.